From the Grace Brethren Church in Sebring, Florida, GCBI site coordinator Ben Ogden sends along the following photos and brief report. For more information on GCBI log onto www.gcbi.net. On Saturday, November 10th, the students of Great Commission Bible Institute had the opportunity to represent Christ and Grace Church of Sebring in our town’s 41st annual Art Festival. 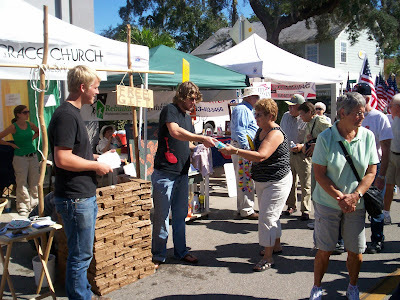 The festival draws thousands of people each year to our downtown “historic” area to celebrate art, food and community. The GCBI gang spent the day handing out free water bottles along with literature on how to make Jesus Christ your Lord and Savior. They had the opportunity to share their faith in Christ with many people and invite them to come check out the church. We are praying that God uses their efforts to produce an abundance of fruit in our community.